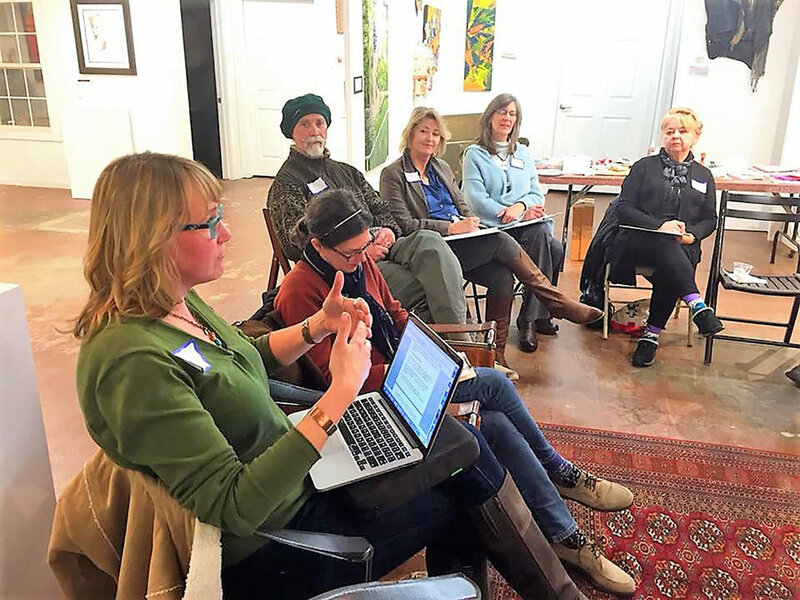 Creating an art community offers many powerful benefits including, mutual support and encouragement, forging unseen collaborations, and fostering cross-fertilization of art forms. My husband and I co-founded the McKinney Creative Community several years ago. Here is a bit about our journey and some tips for making your own creative community if you don't have one. I can't recommend this enough to give your local creative community some juice! When my husband moved to McKinney, Texas from Austin, he was inspired to create a monthly potluck much like a highly successful one he loved in Austin. As it turns out, this desire was buzzing around for some other folks in McKinney too. So, the McKinney Creative Community was established. The first year, a local writer generously opened up her home and lovely backyard as our meeting space. Then, we met in various homes for a couple of years which to be honest, was a bit of a pain to constantly have to organize. Next, a lovely workshop space was gifted to us by a local gardening store. Now, we meet at the local artist cooperative known as The Cove. This place is perfect. We pay a nominal fee each month. My advice would be to find a place where it is the same place every month, as well as the same day and time. We always meet on Second Mondays from 5:30 to 8:30 pm. What happens at our gatherings? It is a potluck, so everyone brings a dish. We also provide wine, tea and water. Upon arriving, folks mingle and partake in the potluck. Then, we sit in a circle and my husband moderates. Everyone introduce themselves, saying what they do and what is new and good in their life plus any announcements to share. He demonstrates by going first. He recommends that there be no cross talk. Otherwise, we might be there 'til two in the morning! If you have a question for someone, you can always go up to them after this part. A new component of our gatherings is our speaker series. This was Leslee Ortega's brilliant idea. She spearheads organizing our speakers each month which has been highly successful. We've had writers, a musician, artists, a puppet maker, a creativity coach and this month an artisan baker will share her story. After everyone has had a chance to speak, we chat and network some more. It is heart warming and inspiring to have a place where you feel supported. There have also been countless collaborations and friendships formed. On more component is our annual Holiday Art Bazaar. In a way, this is our gift to the community. My husband and I, along with the amazing Andrea Holmes, organize this event. We team up with our local TUPPS Brewery and provide booth space to the artisan vendors. Each vendor has a six foot table for their handmade creations. It is held on the first Saturday of December. It is a fun and festive day! We have close to 1200 members on our Facebook page which is also a great resource to post events, workshops, classes or just to share your latest creation. Hope this gives you some ideas and inspiration to create your own creative community.